Even before hoverboards became popular, skateboards and cruisers with integrated lights were all the rave. The problem was that most of the light-up boards that came before the Luma Board were unforgivably weird-looking. 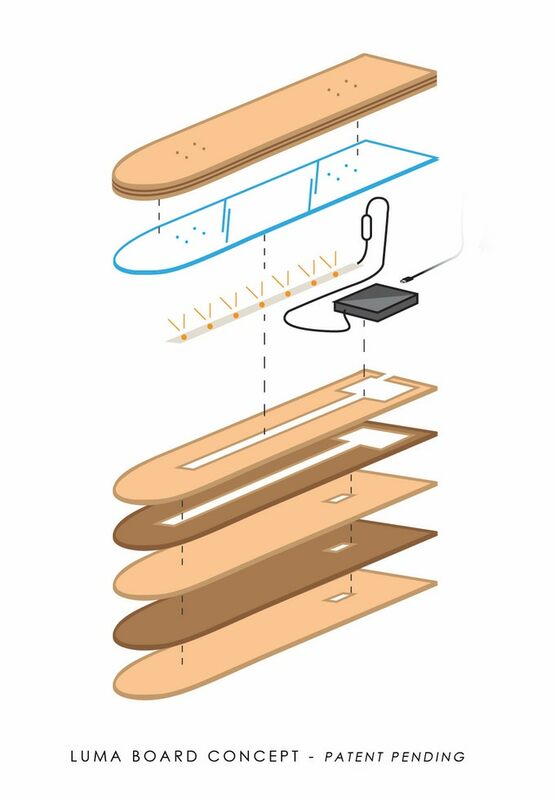 Going by the concept of the new Luma Board, however, those unpalatable skateboard designs are now something we can comfortably live in the past. The Luma Board is handmade from six layers of maple and nut tree wood, a layer of plexiglass, and integrated lighting and electronics. 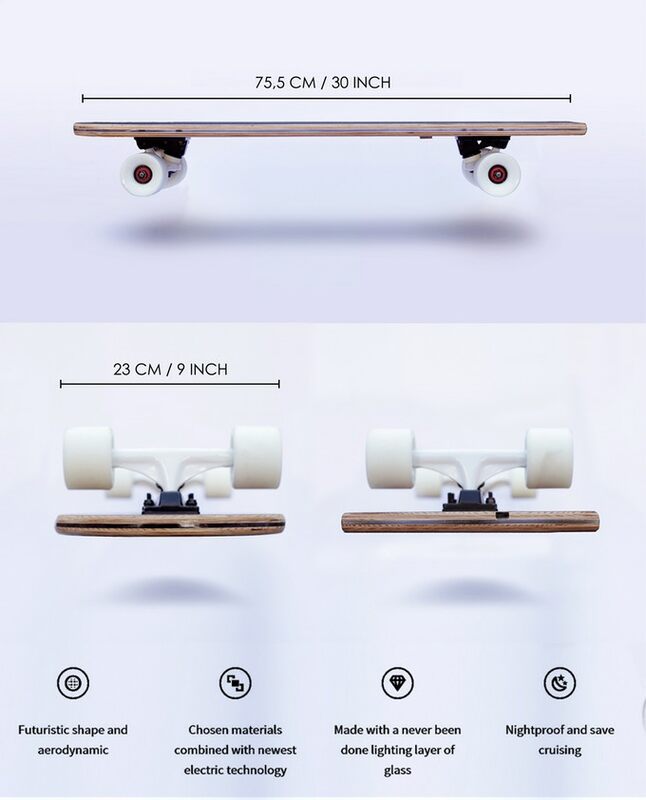 The board measures 30 inches (75.5 cm) in length and has a wheelbase of 9 inches (23 cm). The plexiglass layer primarily facilitates the illumination of the board. However, this layer of glass unprecedentedly consolidates the sturdiness of the board. Save for the glass, which is made using a glass-cutting machine, the rest of the materials, including the onboard electronics and the integrated lights, can be assembled by hand. For effortless cruising, the board uses standard 61 mm 78a wheels with ABEC 5 bearings. These are durable and widely available should you need replacement parts. 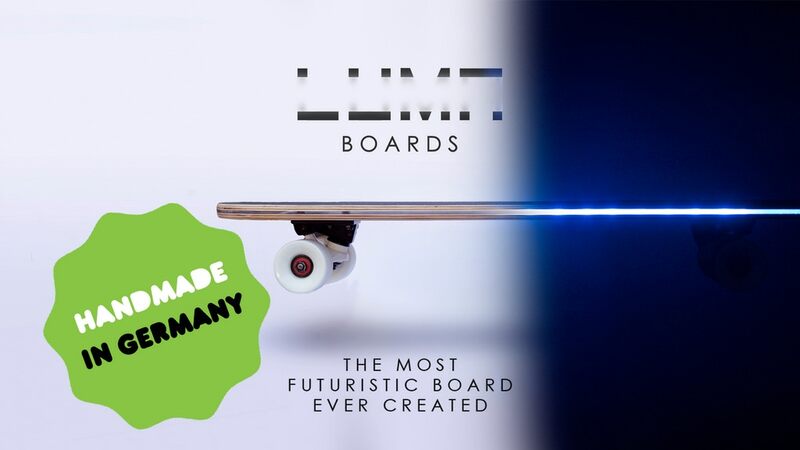 The design of the Luma Board is inspired by the famous hoverboard from the movie “Back To The Future II.” It is not only aesthetically pleasing but also very practical. The surface of the board is lined with traction-enhancing sheet grip tape to improve control. On the underside, the board is bare save for the LED strip running along its length. At the flat end of the board is a mini-USB charging port that connects an integrated battery to a power source. Much of the board’s sleekness is due to its simple yet attractive design. Its wooden finish does not leave much to be desired, especially since the integrated lights provide all the flair it needs to stand out. A simple strip of lights embedded into the layer of plexiglass is all it takes to create a modern yet stylishly retro skateboard. Although the prototype boasts of a color-changing strip of LEDs, it is unclear whether this trait will remain once the Luma Board is officially launched. The switch for the LED lights– located about an inch above the battery– can be toggled on and off to allow you to save your battery for when you’re cruising in low-lit environments. The manufacturer also hinted at the addition of electronics to facilitate options such as dimming, flashing, pulsing and manual selection of colors. Going by the prototype, the lighting strip on the Luma Board will show up to 16 different colors. The 2500mAh rechargeable battery is expected to have a more than decent battery life considering it will only be powering light diodes. Be that as it may, its exact battery life is yet to be revealed. A color-selection app may be created, according to the manufacturer. In addition to functioning as a color selector, the Luma Board app will also display stats such as the battery levels and the current board speed. 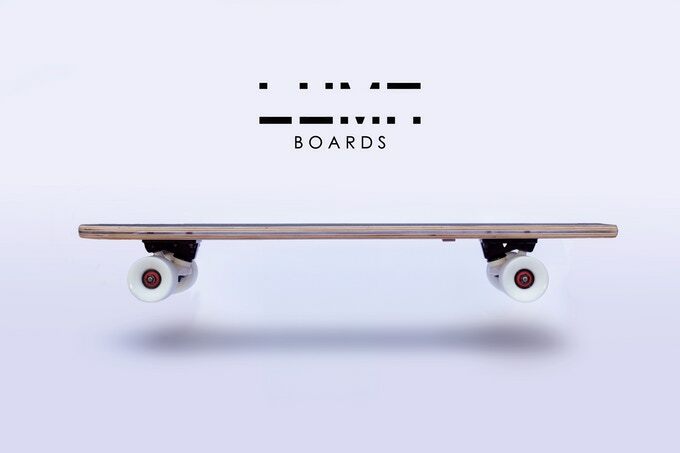 Luma Boards will be modestly accessorized upon the launch of the official product. 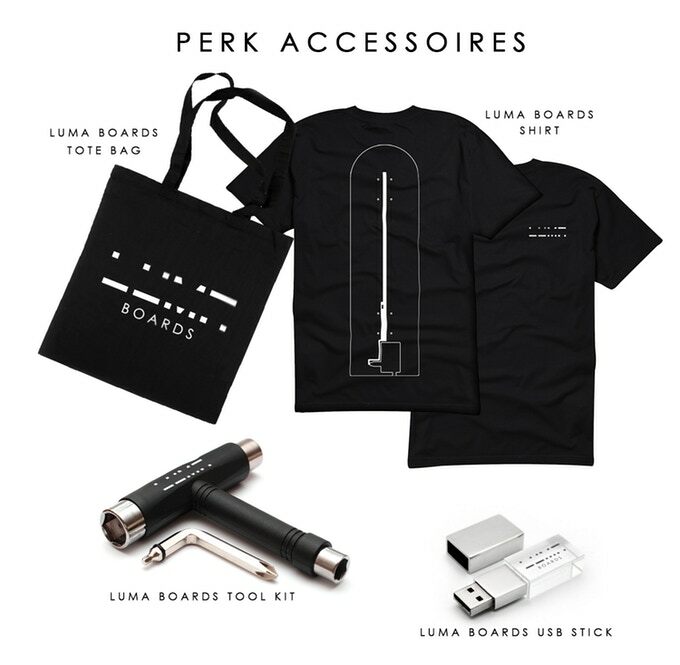 Other than a handy tote bag and branded t-shirts, branded USB sticks, and the manufacturer’s proprietary Luma Board toolkit will also be available for purchase. The Luma Board is very elegantly made. It’s simple design not only enhances its aerodynamics but it also adds to its practicality and overall aesthetics. Despite having integrated lights, there are no protruding switches that can break easily or otherwise interfere with its maneuverability. On this score, the Luma Board gets full points. Compared to earlier skateboards with integrated lights, the Luma Board requires much less maintenance to keep the electronics functioning. The sturdy wood-and-plexiglass build of the Luma Board makes it impressively durable and capable of handling abuse like the best of them. Although the manufacturers have stepped up their design considerably, there are still a few areas that need to be smoothed out before the Luma Board can reach perfection. Customizable light strips remain one of the desirable traits that lack in the concept model. A complete set that includes the Luma Board deck, trucks, wheels, bearings and sheet grip tape will retail at 249 Euros. Every customer who buys a full Luma Board set up will also get a free Luma Boards t-shirt.